Most people don’t even think about cleaning their ceilings or don’t bother to, as they may not think it is important to keep them clean. However, like any other area of the house, your ceiling also needs some tender love and care in order to look its best and brightest. In fact, your ceiling can serve as a breeding ground for harmful germs, dirt, and debris, and the problem will only increase with time. 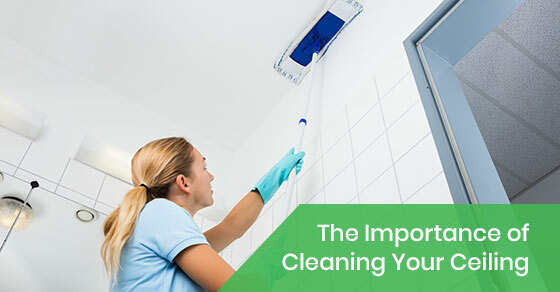 Here, we discuss some of the most important reasons why you should pay the same attention to cleaning your ceiling as you would your windows, walls, and floors. Due to the fact that a typical ceiling is out of reach to the average Canadian, it is often ignored when it’s time to clean the home. However, because ceilings are often left as is, they end up becoming an ideal breeding ground for dirt, cobwebs, insects, and dust. In other words, an unclean ceiling will create the quintessential environment for contaminants and germs to accumulate. Moreover, an unclean ceiling will eventually lead to stains, which will quickly become an eyesore to visitors and will likely help form a bad first impression of your home. As such, we would recommend that you take the time to eliminate unsightly debris from every crevice and that you properly treat stains, eliminate insects, and vigorously wipe surfaces down to help foster a healthy environment. The end result of a clean ceiling that is devoid of bugs, dirt, dust, and cobwebs is that you and your loved ones will breathe easier, and be less prone to allergic reactions when you are home. Yet another advantage of cleaning your ceiling is that it will remind you to maintain the functionality of the space that you are cleaning. That is, you may be reminded to eliminate any obstructions from your fans and registers and to also check your detectors to ensure that they have not expired. Also, while you are up there, you may want to swap out any light bulbs that have died and install new batteries in your carbon monoxide and smoke detectors. Moreover, if you have installed sprinklers in your home, you may want to test them to ensure that they are still working. If you notice recurring stains on your ceiling, then they are likely indicative of a much bigger problem. For instance, such stains may be caused by a major leak. If you’re in doubt, then we would suggest that you call a professional to perform a thorough inspection of your ceiling. If they detect a problem while it is still relatively minor, you will end up saving more money in the long run. Due to the logistical issues that ceiling cleaning and maintenance presents, it may be in your best interest to leave it to the professionals. For instance, you may end up using harsh cleaning chemicals that can make you sick and that do more harm than good to your ceiling. Many cleaning products on the market generate noxious fumes that can cause nausea, headaches, and dizziness. However, by calling a professional cleaning team, they will only use the safest and effective cleaning products to ensure that your ceiling is not damaged by harmful and abrasive chemicals. Cleaning your ceiling may also increase the risk of a fall and cause a serious injury, such as a concussion or a compound fracture. The risk of damage to its finish and/or texture is yet another issue that you should be aware of if you are thinking of cleaning the ceiling yourself. In sum, ceilings are not resistant to grime, dirt, and dust that can cause serious respiratory problems, particularly in the young and the elderly. As such, by cleaning your ceiling, you will not only improve the health of everyone in your home but will also make it a more livable and aesthetically pleasing space. Cleaning your ceiling will remind you to perform tasks that will not only save you money in both the short and long-term (such as inspecting for leaks) but may also save your life. This includes installing new batteries in your carbon monoxide and smoke detector, fixing defective sprinklers, and removing mould and asbestos that has formed over the years. At Sunrise Cleaning, we love to clean and it shows! We have been providing our quality cleaning services in Oakville for over two decades. We are also a full-service cleaning company and offer one-time, move in or out, renovation and spring cleaning, as well as special occasion maid cleaning, and regularly recurring maid cleaning services. With Sunrise Cleaning, you will not only get meticulous, reliable, and timely service but will also save money in the process. In fact, we have a perfect A+ rating by the Better Business Bureau and also offer same-day emergency cleaning services in certain instances. Moreover, all of our quality cleaning services are backed by a 100% guarantee to ensure complete client satisfaction. And every member of our experienced and dedicated cleaning staff is fully licensed and bonded for peace of mind. You’ve tried the rest, now try the best! Call us at 905-567-1199 for a free quote or to book our cleaning services, or visit our website to learn more about our cleaning services and our special offers, such as our 20% discount for first-time customers.